The grain fields are giving way to wetlands today, hooray! The soil is a deep loamy black as we get to the Minnesota border, and we are seeing trees that look like nature put them there, rather than farmers trying to build a wind break. 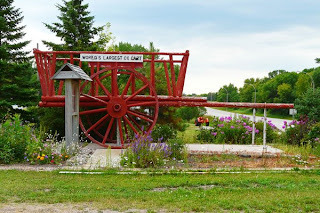 Minnesota turns out to be full of larger than life roadside attractions, beginning with the World's Largest Ox Cart in Crookston, Minnesota. The big red cart lures us to stop, and a sign next to it tells us how back in 1842 traders used smaller versions of carts like this one to haul furs and supplies. Each one could carry up to a thousand pounds of goods, and they would often travel in trains of over a hundred ox carts. The sound of their wheels could be heard six miles away, until 1871, when railroad trains led to the ox cart trains' demise. Not too far down the road we find an ox big enough to pull that Crookston ox cart. 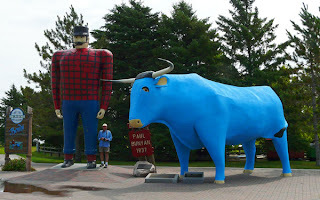 An eighteen foot tall statue of Paul Bunyan, his blue ox Babe by his side, stands next to the Bemidji Tourist Information Center, which claims Bemidji as the birthplace of Paul Bunyan. Paul and Babe were constructed in 1937, and are on the National Register of Historic Places. At one time, Babe breathed smoke from her nostrils and blinked her eyes. She rode on a truck bed as a float in many a parade before the wear and tear to her canvas-covered wood-frame body became so great that she retired permanently to stand beside Paul on the shore of Lake Bemidji. They are without a doubt the most photographed spot in Bemidji. We have our doubts about the Chamber of Commerce boast that "Kodak Company claims Paul and Babe are the second most photographed man-made icon in the nation." Bemidji's nickname is "First City on the Mississippi," since the headwaters of that mighty river are in nearby Lake Itaska. It is theoretically possible to follow the Mississippi River from its headwaters in Lake Itasca all the way to New Orleans by traveling on "The Great River Road," which is not really one road, but a conglomeration of many smaller roads that roughly follow the river's path. We try to drive a section of the Great River Road that runs between Bemidji and Grand Forks, using a map from the Tourist Information Center, and Great River Road signs posted along the route. The map and signs do not match, there are road construction detours, and we get lost several times. Despite all the obstacles to success, we do manage to catch sight of the Mississippi in many incarnations along the mostly dirt back roads through the Minnesota woods. First we see it as a shallow creek barely trickling over a wide dry rocky bed. It passes through several little water lily-edged lakes, and becomes a pleasant canoe route meandering through a marsh. We picnic in a state park campground, where, right next to our picnic table, the Mississippi River flows over a small dam to emerge from Cass Lake and continue on its way to New Orleans. We abandon the Great River Road, and hop back on Route 2, where we stop in Rena (pop. 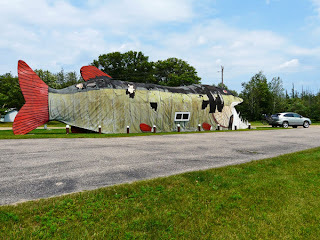 116) to get a picture of a 65 foot long tiger muskie with a 14 foot wide mouth at the Big Fish Supper Club. This roadside attraction proudly proclaims that it was featured in the movie "Chevy Chase National Lampoon Vacation." Our next stop is in Grand Forks, proud birthplace of Judy Garland, where a yellow brick road winds through a little garden in front of one of the two Judy Garland museums in town. Although there are hundreds of yellow bricks bearing the names of donors to the project, a very special section of the road contains bricks dedicated by movie munchkins still living at the time the road was constructed. One of the munchkin bricks contains a famous line which has new meaning in this context: "She is most sincerely dead. Munchkin Coroner." Our most intriguing discovery is the only gas station in the world designed by Frank Lloyd Wright. The gas station is in Cloquet, a small town about fifteen miles west of Duluth. Wright designed a Usonian house in Cloquet for the Lindholms (currently on the market for less than a million dollars). Mr. Lindholm was in the oil and gas business, and Wright convinced Lindholm to let him design a gas station after he did his house. Wright was appalled with the number of ugly gas stations popping up all over the landscape in the 1950s, and wanted to design a beautiful gas station that would inspire others to follow his lead. 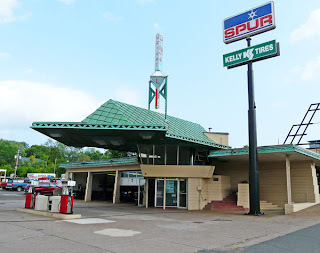 The Frank Lloyd Wright gas station was built in 1958, near the end of Wright's career. At a time when a standard service station cost about $5,000 to build, this one cost $20,000. It has many of Wright's signature elements—a cantilevered copper covered roof extending over the pumps, ornamental copper trim work borders on the roof eaves and edges, and skylights in each of the service bays. He included an observation bay and lounge with windows that look like an airplane control tower on the second floor. Wright wanted to do away with the pumps on the ground, delivering the gas from overhead pipes, but that plan was nixed, due to safety concerns. Wright never actually saw his Cloquet gas station. He sent one of his apprentices to supervise its construction, since he was busy in New York supervising the construction of the Guggenhiem Museum, and he died less than a year later. Unfortunately, we don't see much evidence that his gas station design ideas caught on, as he hoped they would. Our day's journey ends in Duluth. Tomorrow, we'll write about the Lake Breeze Motel, Lake Superior, and beautiful Duluth. Minnesota roadside attractions rock! The Big Fish Supper Club is one of my all-time favorites. You're lucky to have so many great sites in your state. Nice post!